DISCLAIMER: all the photos are linked in from the internet, mainly from the companies own propagation materials, are by no means intellectual property of the author of the article and are presented solemnly for informative and scholarly purposes. I consider this topic interesting for Europeans and North Americans. The reason is simple - the Chinese products are not as yet penetrating the "developped" markets, but may be, in near future. But their presence in markets such as the colombian is strong - so we may learn a bit about our own automotive future. It can be reasonable to expect that the Chinese producers may enhance their knowledge and experience or start beneficial joint ventures (e.g. HAFEI motors in case of the 2001 LOBO model contracted Pininfarina for design of the body and Lotus to design the suspension) with other companies to such an extent as to tackle the greatest problems with security and quality. After that, there will be no obstacles left to start penetrating the most cost-oriented niches in the developped automotive markets. As a source of our investigation we may simply use magazine "AUTOMOVIL" (27/2009, 16.05.2009),printed here by the colombian TELEVISA / MOTORPRESS media group. This particular issue presents overview of most models available on local new / used car markets, including prices. 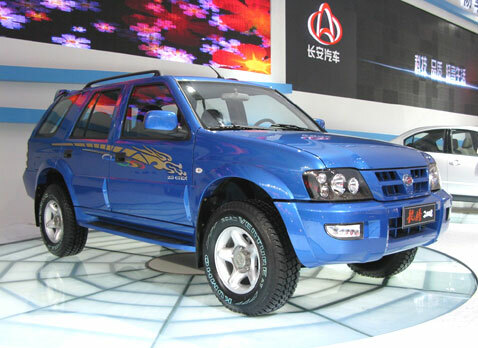 It also presents one larger comparative test of two cheap compact cars of chinese production, and one article introducing the best selling chinese models on the light commercial vehicle market. From the above shown models, in Cartagena there are several Chery QQs employed in taxi service, several Hafei Lobos employed similarly. Second, there is a good deal of presence of the minivans, which provide quite unique architecture, combining crew cab and a pick up configuration in size of japanese minivan. Many Chana stars and Hafeis are present and some DFM. The minivans often serve as school buses. I have seen Zotye auto nomada once or twice. Lets now look at the prices on the market. First, the small family compacts. Lets start from Chevrolet Spark, which is the size of most small family compacts and the ancestor of Chery QQ. The cheapest SPARK is 21.190.000 pesos. But Spark is an old model. Hyundai Santro cca 23.000.000. Korean Kia Picanto, of the same size,also often employed as a taxi costs 27.250.000. Similar Hyundai i10 26.000.000 pesos, Getz cca 27.000.000 pesos. Renault,traditionally strongly present at the market, offers two budget options: the ancient but proven Twingo for 24.170.000 pesos, and the sturdy Logan (in Europe Dacia) for accessible 25.750.000 pesos. If we step up, to models like Peugeot 207, Mazda 2, Nissan Micra, which are the entry models by these producers, the prices are 40.000.000 and more,maybe with exemption of rarely seen and slightly outdated Fiat Palio for cca 38.000.000 pesos. Surprisingly, Chery QQ is only 1.100 000 pesos cheaper that the cheapest Chevrolet Spark. But Ghanghe Ideal 19.000.000 pesos. Modern Chana Benni 24.000.000 pesos. Hafei Lobo is 19.000.000, version taxi only 20.900.000. That shows us that the chinese products are priced roughly 5 - 20 % below the price range of their competitors. That is for the family compacts. It seems that Chevrolet inntentionally went down with the price of Spark, as it is the closest of the "reputable" competitors of the chinese, and along with the clear benefits of tradition and service it manages to acquire huge part of the market. The closest asian competitors may not be seen as that different from the Chinese and are also slightly more expensive and the entry models offer at times less atractive design that the chinese. In the slightly bigger car market, Logan has a very strong presence, again supported by tradition, and also by the sturdiness and simplicity of construction which promises less luxury but more reliability then the chinese product. The luxurious editions of Logan, which may cost as much as 35.000.000 pesos also sellvery well. In this cathegory it is simple as there is virtually no substantial competition for these products! The prices range from 20.000.000 for the simplest pick ups to some 36.100.000 (DFM van pasajeros 1.3). For a price less than smallest Peugeot, Mazda or Nissan we can buy fully equipped van for up to 11 passengers, ready to be commercially employed as e.g. a school bus! With such a price range cheap commercial vehicles such as Chana or Hafei might find their niches on especially european markets as well! Its easy to conceive employment of such useful small vehicles in dense environments such as the mediterranean islands.